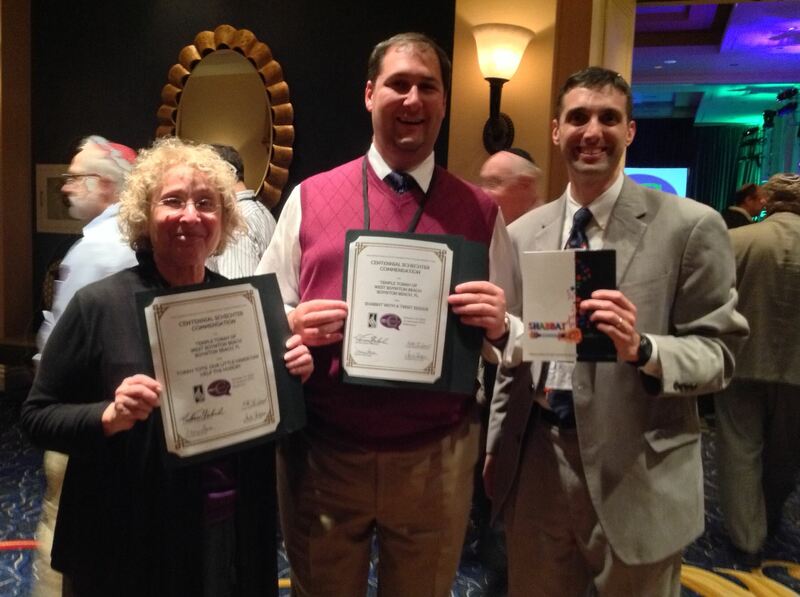 Temple Torah of West Boynton Beach received two awards at the USCJ conference in Baltimore: commendations for Wiston Family Torah Tots social action programming and Temple Torah’s new Shabbat With A Twist Siddur (l to r: Wilma Turk, Cantor Zachary Mondrow and Rabbi Edward Bernstein). Earlier this week, I had the pleasure of joining Cantor Mondrow and Wilma Turk at the United Synagogue of Conservative Judaism’s Centennial Conference in Baltimore. The Conference marked the 100th anniversary of the establishment of this synagogue arm of the Conservative Movement. While there’s much to be proud of in our Movement’s history over the last 100 years, the focus at the conference was on the future. In the background of practically every session was the recently released study of the American Jewish community by the Pew Research Center. No doubt, many of the findings by Pew are cause for alarm and concern and will no doubt influence decisions of Jewish organizations across the country for years to come. One piece of data that has received much attention is that among millennials, American Jews who have only known a world with the Internet, some 22% consider themselves as having no religion. This datum parallels of finding from Pew’s recent larger survey of all religions in America that found that the fastest growing religion in America is none. Of particular concern at the USCJ conference was Pew’s finding that that only 18% of American Jews consider themselves Conservative. This is down from 39% in 1990. We do ourselves no favors by ignoring these numbers and pretending they don’t exist. At the same time, the message of the survey should not be a prophecy of gloom and doom. It should rather be seen as a call to action. Indeed, I was impressed at the conference by the tremendous positive energy. While there was concern about the present, there was a great sense of hope and opportunity for the future. I’d like to highlight two pieces of this week’s Torah portion, Vayera, that seem relevant in light of the Pew report. The first comes from the very beginning of the portion; the second from the end. The portion opens in chapter 18 with God appearing to Abraham as he was sitting at the entrance of the tent. In today’s Jewish community, we have many of our fellow Jews who are outside the tent of the synagogue and the organized Jewish community. Some find the rituals and prayers to be complicated and unfamiliar. Some find the synagogue buildings large and imposing. Some find they do not know anyone and therefore to cross the threshold is a major obstacle. The conference of this past week reminded us that many of our fellow Jews are eager for a sense of community and deeper meaning in their lives. Those of us within the tent need to make greater efforts to bring our fellow Jews into our synagogue and our community. This is an ongoing challenge in a time when there are many competing demands on people’s time, energy, and resources. I do believe that a sense of sacred community and the unique blend of tradition and modernity which we call Conservative Judaism has a compelling message. We need to work creatively and passionately to bring more of our neighbors and friends into the tent of Jewish life, and specifically Temple Torah. We are in the midst of a strategic planning process that I hope, once completed, will strengthen our role a warm, welcoming, open tent for Jews in our area across generations. Parashat Vayera closes with the story of the Binding of Isaac, or “Akeidah.” As Abraham and Isaac, along with the two unnamed lads who accompany them, near the end of their journey, the text reads: “On the third day Abraham looked up and saw the place from afar” (Gen. 22:4). The two lads are supporting cast members who typically get lost in the psycho-drama of the narrative. Yet, the rabbis in their careful reading of the text take note that they were left behind as Abraham and Isaac ascend the mountain. The rabbis ask why that is, and their answer is that they were not filled with a sense of awe. They did not sense the presence of the divine in creation. Abraham saw the makom, the Place (which, in rabbinic Hebrew becomes another name for God); the lads saw a wasteland. Therefore, Abraham excluded them from further participation in this momentous occasion. Of course, we can ask numerous questions about the lads and presume our own course of action if we were in their shoes. We might gather from the text that of course Abraham excluded them. Why would he want them snooping around, given what unfolds? If we were there, would we surreptitiously follow our masters up the mountain? Would we call the police when we saw Abraham raise his knife? Would we run and tell Sarah (Oh, yes, she does die suddenly in the next chapter, doesn’t she?)? This particular midrash overlooks all of these questions and directs our attention to the broader atmosphere. Abraham and Isaac are not without their faults. Abraham follows God’s instructions in an unquestioning way that is incongruent with the Abraham who argues with God over the destruction of Sodom and Gomorrah. Isaac, for his part, is passive. He may well be an adult already but is willing to go along with his father’s plan. His willful passivity (assuming that to be the case) demonstrates his own lapse in concern of the sanctity of life in the name of serving his God. In reading the text one is left with little doubt that the main characters were deeply scarred by this episode. God never speaks to Abraham again. Abraham and Isaac never speak again. Sarah dies. All of this is true, and still the rabbis writing the midrash above were bothered by those two anonymous youths at the bottom of the mountain whom we never hear from again. Abraham and Isaac, for all their faults, are looking for the spark of the divine in their lives. They are imperfect in their comprehension of it, and they are hurt in the process; however, they still care. The rabbis interpret the two lads as indifferent to the divine presence, and indifference is taboo in the Torah and in the annals of Jewish interpretation. One astounding statistic in the Pew Report that has not received enough attention is that when people were asked if they had a positive or negative sense of Jewish identity, 94% responded positive. That is really incredible. 94% of American Jews are proud to be Jewish. It’s just that the majority of them don’t presently feel engaged by Jewish institutions, for whatever reason. We should not be like Abraham’s assistants who lost hope. We should rather be like Abraham and Isaac who, according to the midrash, sense an opportunity to encounter the divine. We should seek out opportunities for deeper engagement with fellow Jews who may be seeking meaningful involvement. Let’s not write anyone off. In every challenge lies opportunity. As the rabbis interpret, at a momentous time in the Bible, two youths were pessimistic and indifferent and were excluded from further participation. A message we can take from Parashat Vayera is that it’s in our power to open our tent, bring people inside and encounter the divine through our shared community. May we be so blessed.